Kelsi woke up the morning we were leaving Udaipur sick as a dog. It was painful. She skipped breakfast and slumped into the back of the car. I don’t think I heard more than four words from her the entire drive to Pushkar. I felt terrible that there was no way I could help. When we arrived in Pushkar she immediately climbed into bed in the foetal position and fell asleep. I sat for a little while then decided I would go into town. It was Kelsi’s birthday the next day, and I had promised, months earlier, that I would get her a cake! I had looked up the only German bakery in all of Pushkar and found it on our city map. It was at the Sunset Cafe restaurant and actually came recommended in the lonely planet guide! Pushkar is a tiny town, but we managed to stay at the hotel on the furthest outskirts of the city center as possible. It was still only a 15 minute walk to the edge of town though, and after being cramped up in a car all day the exercise was welcome. I found the cafe surprisingly fast. It was right along the lake with an incredible view of the sunset (thus the name of the restaurant I guess). All of a sudden one of the waiters came over to me. Nope, that wasn’t going to last over night. I was about to leave when the owner of the restaurant came up to me. “Can I help you?” He asked politely. I explained that I was looking for cake, but couldn’t quite find what I was looking for. I wasn’t expecting that response. I stood there thinking for a moment. “Can you do carrot cake?” It was Kelsi’s favourite, and yet I hadn’t seen it at all in India. Before I knew it, Papu (the owner) had me sitting down in a meeting with the baker. He was a lovely, round man named Krishna who had come all the way down from the bakery to speak with me in person. His laugh ad his flamboyant nature made it hard not to like him immediately. What is it with people and chocolate carrot cake? I’ve never even heard of that! “What about chocolate icing?” he smiled a big grin. “Oh, Krishna can do anything!” He said again. Seriously, these people could not have been any more lovely! I thanked them so much and then made the trek back to take care of poor Kelsi. The next morning she wasn’t any better. “Happy Birthday baby!” I told her as she woke up. She groaned. “You know you’re getting old when you forget it’s your birthday” then she curled back up in pain. I have to hand it to her though. She sucked it up and we made it into town for the morning. The markets in Pushkar are incredible. It is just one long road that wraps around the little lake that sells a million different things from the markets. We took about an hour to walk three blocks. We kept stopping in at different shops, looking at the jewelry and the brightly colored scarves. We had to take some time to rest along the way as well. Having not eaten in almost two days, Kelsi was exhausted. We sat in the shade on the steps by the lake and watched the world go by. 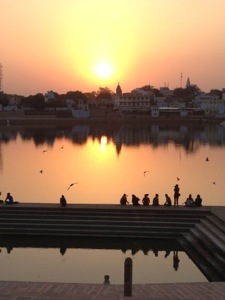 The Pushkar lake has a bunch of bathing ghats all around the edge. People, young and old, took the time to swim and bath in the waters before carrying on their way. Even a cow was seen cruising up and down the walkways with a headband on, just checking out the watering holes. People watching at its best. For our lunch stop, we found a little restaurant that had a small garden out back. The air conditioned restaurant was busy with locals, but we decided to sit on our own in the garden. When we had finished eating Kelsi looked at the garden behind me. I turned around, and sure enough there there was a big old turtle slowly cruising along the garden. Our waiter heard us and laughed. “There are 5 of them” he said. Then he walked around the garden in search of them. Within minutes he had come up with four of them. He stacked them all in a row for us. 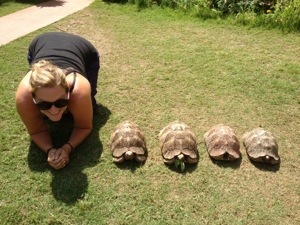 We spent way too long taking photos of these silly turtles. It was the highlight of the day! Our waiter just shook his head… Crazy tourists! After lunch we had to go home for a nap. Hours out in the sun was too much for poor Kelsi, so we rested until dinner. “Do you have a place in mind for dinner?” Kelsi asked me as we were about to head out in the evening. “Ya I think so. I found a place yesterday that looked great for watching the sunset. We can check out the menu and see if we like it” I suggested. 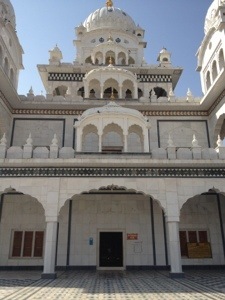 We had Raju drive us to the edge of town, then walked the rest of the way to the restaurant. Kelsi was in a daze, already searching for a table and going through the menu when the young waiter from the day before spotted me. “You! Oh! We have your cake! It is here!” He pointed to the fridge where the cake was sitting. I sat down with Kelsi who was still so sick that she hadn’t even heard the conversation go on. “The menu looks good, lets eat here” she said. Perfect. Papu showed up and I ran to go talk to him, leaving Kelsi to mull over the menu, still oblivious to her surroundings. “Okay, okay! Ill bring the cake over whenever you like!” He offered. I looked back at Kelsi. She was never going to make it through a meal and a cake. “Better bring it over right away” I suggested, then left to go sit back at the table. A couple minutes later our waited came over with the cake in hand. “Would you like a candle?” He asked me. Haha, well too late now! Kelsi looked confused, then it clicked that it was a birthday cake. “Surprise!! Happy birthday!” I said as the waiter out the cake down. She started laughing. The waiter rushed off and came back with a huge candle in hand. It was so big it wouldn’t fit in the cake, so he stood it up in front if the cake and lit it. The whole thing was pretty ridiculous, and Kelsi was genuinely surprised. She made her wish, blew out the candle and we tried it out. It wasn’t the most spectacular tasting cake, but it wasn’t half bad for being vegan (yup, Pushkar is a completely vegetarian city, and the only bakery is purely vegan). 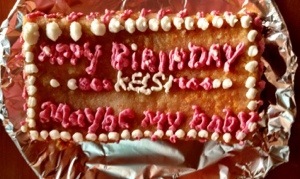 Krishna had done an excellent job of decorating it, and the surprise was worth it! In the end, Kelsi was too sick to eat the cake, but we gave it to the helpful staff at our hotel who seemed very appreciative. We watched the sunset as we ate dinner, and then off to bed early. 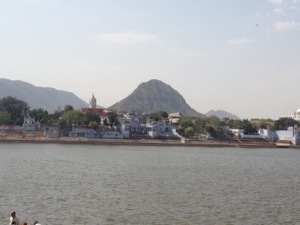 Pushkar was small, but it’s energy and laid back vibe made it my favourite town in India so far. The people are friendly, the merchants are not pushy, the views are spectacular, and if they’d sold meat and beer the place would have been perfect! Jaipur has a lot to live up to! 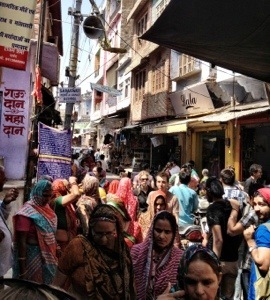 This entry was posted in Asia, India and tagged birthdays, Markets, Pushkar, too sick to have fun by hilarylust. Bookmark the permalink.